As part of its "Best Days" sale, Samsung has announced attractive deals on the Galaxy Note 9 and Galaxy S9+ flagships. Under this limited time offer, the company is offering a cashback of upto Rs. 8,000 via HDFC credit/debit cards and an additional exchange discount of Rs. 9,000 on both the smartphones. Here's a detailed look at all the offers. Under the sale, the Galaxy Note 9 model with 8GB RAM/512GB storage will be available at Rs. 77,900 as against its launch price of Rs. 84,900. Notably, this price includes a cashback of Rs. 7,000. Moreover, with an additional discount of Rs. 8,000 available on HDFC credit/debit card users, the effective price of this top-end Note 9 variant will come down to Rs. 69,900. As part of its "Best Days" offers, Samsung has also a bundled discount on the Galaxy Watch. Under the offer, those who buy the Galaxy Note 9 can get the Galaxy Watch for just Rs. 9,999 as against its full price of Rs. 24,990. The Galaxy S9+ has received a price cut of Rs. 7,000 and now costs Rs. 57,900 for the base-end 64GB model. Likewise, the 128GB model is listed at Rs. 61,900, whereas the 256GB variant now retails for Rs. 65,900. Moreover, HDFC credit/debit card users can avail an additional discount of Rs. 6,000 to further bring down the price of Galaxy S9+. In case you don't have an HDFC card, Samsung is offering an additional exchange discount of Rs. 9,000 as part of its upgrade offer. Under this offer, which is applicable on both the Note 9 and S9+, you can exchange an old, working smartphone to get an extra Rs. 9,000 off over the regular exchange value of your handset. 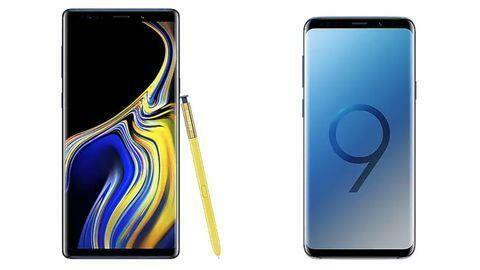 To recall, Galaxy Note 9 features a 6.4-inch QHD+ (2960x1440 pixels) AMOLED display with 516ppi density, an 18.5:9 aspect ratio and is IP68-rated. It is powered by the Qualcomm Snapdragon 845 processor/Exynos 9810 chipset, paired with 6GB/8GB RAM, 128GB/512GB storage (supports upto 512GB microSD card). Moreover, the phone packs a 4,000mAh battery with support for wireless charging and runs Android Oreo-based Samsung Experience. What's the camera like on Galaxy Note 9? The Galaxy Note 9 offers a dual rear-camera setup comprising a wide-angle dual-pixel 12MP sensor with a variable aperture (f/1.5-f/2.4), coupled with a 12MP (f/2.4) telephoto sensor with 2x optical zoom and 10x digital zoom. Up front, there's an 8MP camera with an f/1.7 aperture. Meanwhile, Samsung Galaxy S9+ features a 6.2-inch QHD+ (2960x1440 pixels) AMOLED display with 516ppi density, an 18.5:9 aspect ratio and IP68-rated dust and water-resistance. It is powered by the Qualcomm Snapdragon 845 processor/Exynos 9810 chipset, paired with 6GB RAM, and 64GB/128GB/256GB storage options (supports upto 512GB microSD card). It packs 3,500mAh battery with support for wireless charging and runs Android Oreo-based Samsung Experience. The Galaxy S9+ sports a dual rear-camera setup featuring a wide-angle 12MP sensor with f/1.5-f/2.4 variable aperture, OIS, Dual-Pixel PDAF, and a 12MP (f/2.4) telephoto sensor with 2x optical zoom and OIS. Up front, the phone gets an 8MP camera with an f/1.7 aperture.